MBAC Stand Up Paddling (SUP) Instructor, Pamela Strom, won 1st place in the 12’6” category of the La Jolla Invitational, a paddling race that is part of the Southern California Ocean Racing Series. The 5 mile race held at La Jolla Shores hosted over 200 participants consisting of SUPers, kayakers, and outrigger canoe paddlers. Before becoming a stand up paddler, Pamela was a state champion in the outrigger canoe. 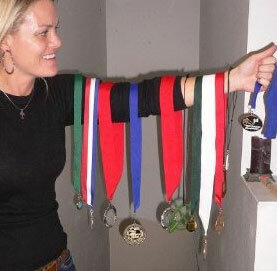 She's a veteran paddler who has been competing in paddling races since 2006 and has an impressive resume of finishing in the top of her categories. She has also been featured in several paddling publications. The race at La Jolla presented some real challenges, even an experienced paddler like Pamela, due to rough water produced by an offshore storm. Part of the strategy of SUP racing is to read the water and take advantage of the swells. Finding opportunities to ride sideswell, or using the waves to push you along the race course, is an important factor to do well in competition. With swell, wind and chop coming from all directions, reading the water can be a real challenge, even for veteran racers. 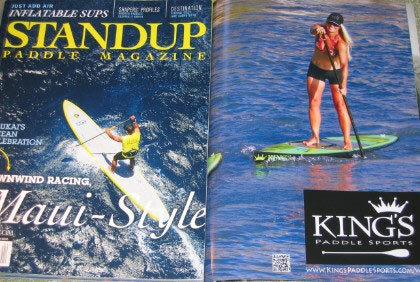 King's Paddlesports will be at MBAC this Sunday from 9am-12pm for anyone who would like to demo their boards and paddles. Pamela is a team ambassador for King’s Paddlesports, who will be at MBAC this Sunday, December 4th, from 9am-12pm for anyone who would like to demo their equipment or learn more about stand up paddling.